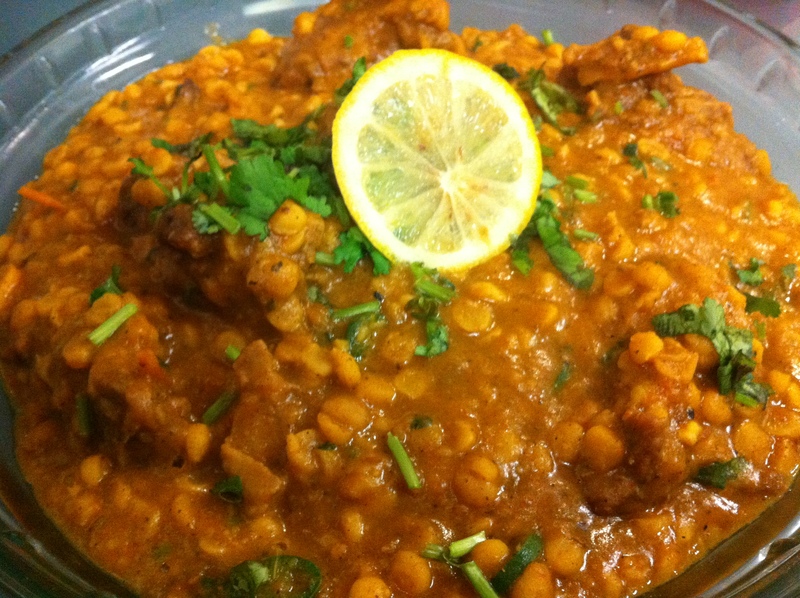 Dal Gosht is a very popular mutton and dal recipe. It is a non vegeterian's idea of having dal(pulses)soaked with the flavours of meat and with a blend of spices. The mutton gets so tender making it succulent and very delicious. Make it for a Saturday dinner or Sunday lunch and I am sure u all would enjoy it. 1. Combine meat, water,salt,onion and ginger garlic paste in a pressure cooker and cook it on low heat for 20 mins. 2. Now add the lentils and sme water and again pressure cook for 15 mins. 3. To the boiled meat and lentils add tomatoes, red chilli powder, turmeric garam masala powder, cumin and coriander powder tamarind pulp and cook till very less water is left. 4. Heat oil in a deep vessel and fry chopped onions, crushed garlic, whole red chilli and add the meat and dal mixture. When it starts boiling add kasoori methi. 5. Garnish with green chillies, coriander leaves(chopped), lemon wedges and serve hot with naan,chapaties or steamed rice.